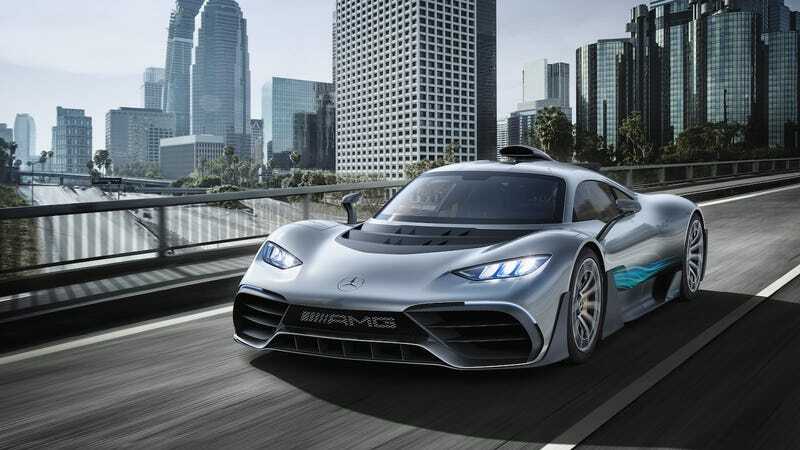 The Mercedes-Benz AMG performance division said two years ago that it would make a $3 million Formula One car for the road, built with the engine used in a series often called the pinnacle of motorsport. But it’s not so easy to tone down an F1 engine to the point that it can share stop lights with the Ford Fusions of the world, which is why the car’s on a nine-month delay. The promise of a road-legal F1 car came complete with the promise to use the 1.6-liter turbo V6 hybrid the series introduced in 2014, but as it turns out, this hasn’t been as easy as plopping an F1 engine into a street car and zooming off. Race cars and road cars are far different from each other, in more than just a “one is fast and loud and the other is slow and quiet” kind of way. Road cars have all sorts of regulations they have to adhere to, like those pesky emissions rules that automakers just can’t help but try to cheat around. Heat is not the problem. The heat is not high. Getting a stable idle at 1,200rpm, that’s challenging. To give you a simple example. You have leakage in the throttles in Formula One and nobody cares, because it runs at a 5,000rpm idle. At a 1,200rpm idle, you have to meet the emissions regulations. You need a stable, proper idle. If it’s unstable, your emissions are unstable. Do you know what the F1 car emits? No [smiles], but it’s really good at 11,000rpm. The F1 car revs to 14,000rpm, but at 11,000 [the One’s reduced but it’s still an insane redline] it’s really good. The engine is unbelievably efficient. One reason the car needs a lower idle than 5,000 rpm is because not only would it would be extremely loud, it would probably be a bit, uh, jumpy for a mere mortal to drive. Another is because 5,000 rpm burns a lot of fuel, and tightening emissions regulations—at least, in some places—want street cars to do less of that. Vehicles get emissions ratings to determine if they meet the legal limits, so, like Moers said, unstable emissions wouldn’t work on the final product. Another thing Moers mentioned is that the One, being a road car, won’t take the racing fuel that F1 cars do. That means while the Mercedes-AMG One will have an F1-ish engine in it, it won’t be exactly the same as the one Lewis Hamilton is about to drive to another F1 championship—and probably another after that, and a few more after that. It’ll be a little more toned down and a little later than expected for the people who had a spare $3 million to toss at it, but Moers told Top Gear customers don’t mind because they want the car to work as it should in the end. Also, if they can afford one $3 million car, they probably have another one they can drive around. Probably a used Toyota Matrix or something. What does it sound like at idle? Either way, don’t be fooled. The engine that comes in the Mercedes-AMG One will only make “BAAAAAARRRRRRRRRRR!” sounds for 31,000 miles before it needs a regulations-adhering replacement, because that’s all it’s designed to last for. Good thing rich people don’t drive their collectables that much.